Peru's ambassador to Canada is set to get a promotion — to the presidency. Peru's ambassador to Canada is in line for a promotion — to the presidency. Martín Vizcarra is headed back to Peru today after President Pedro Pablo Kuczynski offered his resignation Wednesday, ahead of an impeachment vote. Pressure was mounting on Kuczynski to step down after secretly recorded videos emerged showing several of his allies allegedly trying to buy the support of an opposition lawmaker. Vizcarra, who has been serving as Peru's ambassador to Canada since October 2017, is also the country's first vice president and is now in line to become Peru's next leader. "He will be finishing his duties as ambassador today and he's on his way back to Peru," said Natalia Santanilla, executive assistant to the ambassador in Ottawa. 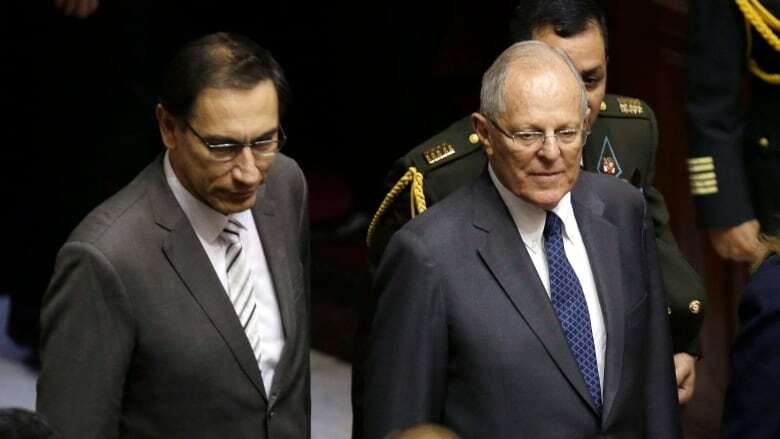 Peru's congress is expected to debate Thursday whether to accept Kuczynski's resignation or proceed with planned impeachment proceedings. In December, lawmakers initiated the impeachment process over Kuczynski's ties to the Brazilian construction giant Odebrecht. He was accused of lying about $782,000 in payments his consulting firm received a decade ago from the company. If Vizcarra and Peru's second vice president decide to resign alongside him — something they have vowed to do in the past — power would be transferred to the head of congress, who would be required to call new elections. Santanilla said Vizcarra was asked to return to his country on Wednesday and embassy staff in Ottawa were notified Thursday morning. "I have no idea what's going to be happening in the next days in Peru," said Santanilla, who admitted news of the ambassador's departure came as a surprise. On Wednesday night, Vizcarra posted on Twitter that he was outraged by the current situation in Peru but, in keeping with his country's constitution, would return home to fulfil his duties. Meanwhile, the eighth Summit of the Americas is scheduled to take place in Lima on April 13 and 14. Global Affairs Canada was not immediately able to comment on how the situation may affect Canada's plans to attend.